Originally formed with origins that are German, Swedish and Swiss into the Continentale Linoleum Union in 1928, Forbo came into existence in its present form between 1973/74. At our Wakefield Flooring shop we are proud to stock vinyl flooring by Forbo, flooring systems which place design at a premium, alongside quality, durability and sustainability. High specification and innovative vinyl design in wood, stone and metal aesthetics, all for a multitude of purposes. 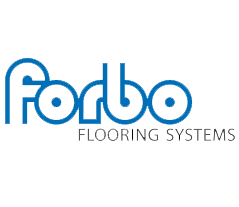 Forbo flooring systems have been adapted with highly technical solutions for both the home and commercial market. For whatever purpose, in every location, Forbo presents flooring to suit a building’s every concept and specification. Forbo’s General Purpose Vinyl range is available in traditional wood and stone formats. Forbo’s abstract style range in striking digitally printed designs provide a unique and flexible approach to style. With Forbo’s sustainability pledge, 50% of Eternal GPV’s backing is manufactured using recycled materials. 62 colours to choose from in vinyl with an innovative dirt-repelling SMART treatment layer for heavy tread workplaces and overlaid with embossing process for premium finish this is durable vinyl easily combined with other Forbo flooring ranges. Particularly attractive to education, healthcare and modern public buildings where highest abrasion wear rating group T/EN660-2 reduces impact of footfall, extending stability and durability of this tough wearing flooring range. Forbo’s vinyl range with acoustic treatment for softer footfall, useful in public spaces where a quieter ambience is of premium concern. Impact sound reduction measured between 15dB and 19dB. For the home environment Forbo’s Novilon Cushion Vinyl flooring range comes in traditional wood, tiles and Classic (incorporating traditional approaches as well as mosaics), contemporary floor furnishing ranges in Viva, Viva Fusion and Futura (metallic tiles to on trend style with wood). Coming with the durability of Diamond Seal a natural low gloss, Novilon provides hard and scratch resistant flooring, slip resistant with Aquagrip surface technology. Noviclean top layering provides easycare. Novilux Graphic is Forbo’s remake on the more traditional style vinyl, with contemporary colouring and patterns. A pattern repeat of 150cm adds increased design authenticity. Novilux traffic delivers high impact wood and anthracite inspired vinyl with a measurement of 17dB acoustic sound reduction, R10 slip resistance category due to its Aquagrip surface technology.